For people like me who love Halloween, Halloween parties are a great way to get the gang together, get in costume, eat fun food and drink fun drinks. A few years ago, I started throwing my own little parties with some close friends. They seemed to keep growing. Last year marked the beginning of the themed parties thrown my my friends and me. Last year was Harry Potter Halloween Party. It was a pretty big hit. Except that our apartment was way too small for the crowd that came. We had food, mostly stuff that was mentioned in the books. Some drinks like pumpkin juice (which was quite a pain to make, actually). That and almost all of the food that we made or had guests make was from The Unofficial Harry Potter Cookbook which a friend of mine owned. Chocolate Frogs and Jelly Bellies in many flavors were a must. We also made butterbeer (cold, which we couldn't decide if authenticity should come at the cost of taste... it is supposed to be warm after all...). The recipe we found and tried was basically lots of cream soda mixed with butterscotch schnapps. At the experimental phase we decided it was WAY too sweet. What did we do for the final delicious (and popular) beverage? Added beer. Yep, about half Coors (because it was light and not overpowering in flavor... and cheaper than others...) and half cream soda and added some butterscotch schnapps. I know it sounds odd, but it was quite tasty. I am not sure on the exact proportions, but I'd say just mix it until it tastes good to you. We strung white X-mas lights across the ceiling and had candles and jack-o-lantern lights all over. We didn't use any other lighting. I had lots of colored streamers on the walls for each house. My talented friends painted Hogwarts House posters which we hung up (and I still have because they are AWESOME). Latin at the bottom means "Let Sleeping Dragons Lie" I believe. Interesting eh? My favorite. We agreed to do Ravenclaw from the books so bronze and blue! Yay! We had a few games. Everyone had to be assigned a house which was done by drawing colored ribbons out of a bowl while wearing our home-made sorting hat (felt). We had a "put the sock on Dobby" game and a Quidditch bean bag toss and we kept track of winners for house points. Over the door outside we made a cloth "brick wall" (red cloth with a brick pattern painted onto it and hung like a curtain) to go through to get to my door. On my door hung a sign that read "Hogwarts Express" and on either side of the curtain were a "9" and a "10." I sent out invitations in the mail. They were formatted like the Hogwarts acceptance letters. I used the Lumos Font and I found a picture of McGonagall's signature. For the list of required items, we had divvied up the things we needed and asked guests to bring them in place of school supplies. Here is another good resource: Invitation Letter. 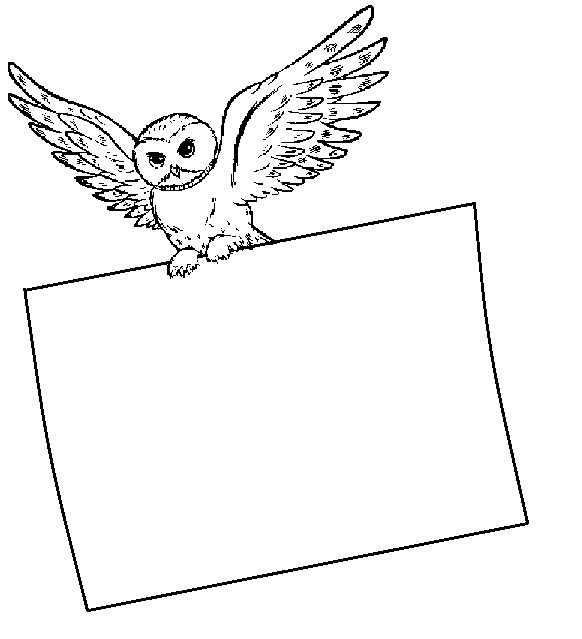 I also found a basic owl picture and drew in (on the computer) a square to make it look like it was carrying a letter. That is where I put in the guests' name and address. The pictures below are basically what ours looked like. I know the font looks hard to read, but I had to shrink it for the picture. When you print it out, it is actually quite legible. 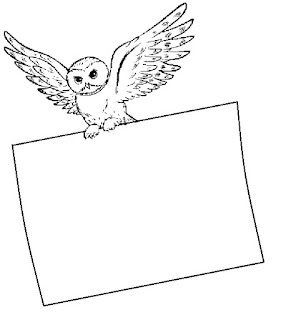 This was the image on the envelopes. 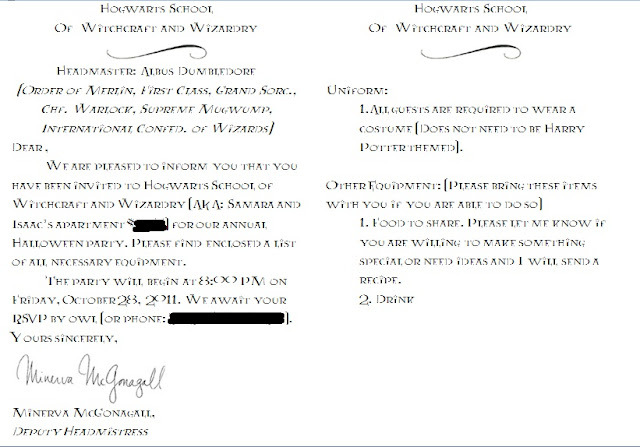 I typed in names and addresses, also using the Lumos font. And, of course, I dressed as McGonagall for the party. It was great fun. We also developed special shots (which were in individually corked glass bottles) for each house. The Ravenclaw one was especially popular, followed by the Hufflepuff. If we can find the list so we know what was in each, I will post them. For the best Harry Potter Party that we found, go here: Welcome to the Hogwarts Celebration. I wish I could have been at that party... We did take several ideas from her. And I tried so hard to find some plastic or cloth that looked like stone to put on the walls, but no dice. Check it out. I wanted to post all of the above as references for anyone else who might want to throw a HP party. On to this year. This year the theme is: Tim Burton movies. No formal invites or anything too big because we are pressed for time and money. This is the first year we are renting space for said party. Crazy, eh? Lots of black, white, red, and grey decorations. Interesting selections for food and drink. I will be dressing as Katrina Van Tassel from Sleepy Hollow. I am trying to "throw together" her riding dress and coat. I will have a special costume post detailing that bit. Isaac may go as Ichabod Crane, but I need his help getting his costume together. As such, I am taking care of some of the black and white decor, table ware, and Sleepy Hollow decorations. Food and drinks are another matter. There are lots of costume opportunities. I will have a post after the party with pictures and details.